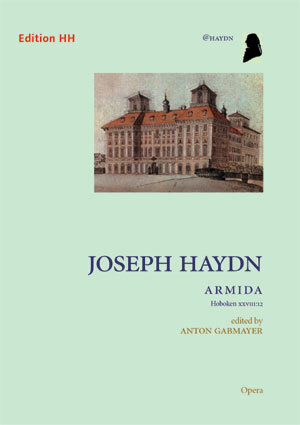 Not only is Armida Haydn’s most highly regarded opera, but the composer himself, on completing the score in 1783, referred to it as his best work. Topically interesting – love versus duty in the time of war – Armida is suitable for large and small opera companies alike and offers tremendous scope for imaginative staging. Based on the autograph score in the Royal College of Music, London, and on manuscript fragments in Eisenstadt, this edition has been prepared by the distinguished Haydn conductor Anton Gabmayer, since 1992 musical director of the Haydn Festival at Eisenstadt, with which Edition HH has forged close links. Armida was written for Count Nikolaus Eszterházy’s palace theatre in Hungary and first performed there, with spectacular success, on 26 February 1784. Between 1784 and the theatre’s closure in 1790, it received a total of fifty-four performances, and was also staged in Vienna (1791), Preßburg (1786), Budapest (1797) and Turin (1804). The score itself was not published until 1965 (as part of the complete Haydn edition), and the Wrst modern performances (a concert version for Cologne radio, followed by a fully staged performance in Berne) took place three years later. The Haydn Festival in Eisenstadt gave notable performances during its 2001 season, and in 2007 Armida was one of the most important opera productions at the Salzburg Festival. An Italian dramma eroico loosely based on an epic poem by Torquato Tasso, Armida is set at the time of the Crusades. Its theme is the superior call of duty over the seductive voice of love. The person at the centre of this dilemma is the crusading knight Rinaldo, who is loved by the sorceress Armida. Although it appears that love will triumph, Rinaldo succeeds in tearing himself away and Armida’s aVection turns to hatred. The opera ends with the participants pondering their fate against a background of martial music.